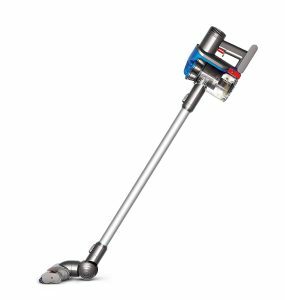 The Dyson DC35 is an entirely efficient cordless vacuum cleaner that can assist you in cleaning the hardwood floors and even carpets in your home without making a strenuous effort. Having been equipped with a dependable 22.2V lithium-ion battery, this model proves its worth under most circumstances as its performance will not disappoint you. Some of the owners who were kind enough to express their opinions about the way this electric broom can serve them have reported that the unit is a bit too heavy for their taste. It also costs a pretty penny, particularly when compared to other models manufactured by the same brand. Nonetheless, due to its portability and suction capabilities, most people seem to think that all of this is not a drawback per se. Nothing beats the convenience offered by cordless vacuum cleaners, and here’s where the Dyson model is a clear winner. While owners are advised to charge the battery for as many as 5.5 hours when they use this unit for the first time, the fact of the matter is that it’s one of the most dependable and easy to use alternatives we have come across. You have the option of choosing between a MAX suction mode that can assist you in performing difficult tasks for up to six minutes or a dual power mode that will let you clean floors regularly for up to 15 minutes. Unlike other products in the same line, this one isn’t particularly heavy. Since this is an electric broom, there’s little talk with regard to the efficiency and sophisticated development of a filter. Nonetheless, the core difference between this Dyson unit and others consists of the fact that this one is equipped with a Root Cyclone Technology that makes it possible for the vacuum to avoid losing suction power. Despite being a bagless option, this electric broom does precisely what it is supposed to, and more importantly, it won’t let any dust get out of the container once it’s been trapped inside the unit. What’s more, the component where the debris accumulates while you do your chores can be emptied with ease. 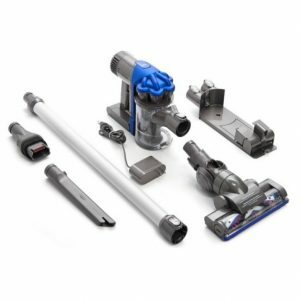 When searching the market for the best electric broom available for sale, it’s important to look at the number of accessories that the main unit comes with. Fortunately, you won’t have to bother too much with this product as it is accompanied by a crevice tool and a combination brush/wide debris nozzle tool which make cleaning furniture and upholstery a breeze. Besides, it should be noted that you can always remove the wand and utilize the Dyson as a regular handheld car vacuum. Both the battery and the charger are included in the deal, which is to be expected given that, if you lose one of them, you have to get in touch with the brand’s customer support and purchase a replacement individually.